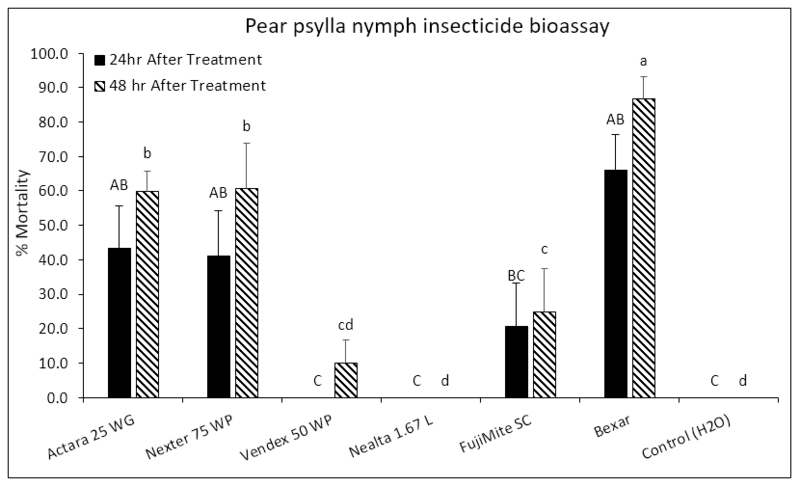 A laboratory bioassay was conducted to test the toxicity of various insecticides/miticides to pear psylla nymphs (Fig. 1). Nexter (pyridaben), Vendex (fenbutanin-oxide), Nealta (cyflumetofen), FujiMite (fenpyroximate), and Bexar (tolfenpyrad), were chosen due to their similar modes of action: disrupting mitochondrial function. Bexar (tolfenpyrad) is still undergoing registration for pears. This assay is a part of a series involving Bexar which will help determine its most apt placement in future pear IPM programs, if approved. Actara (thiamethoxam) was included for comparison to a common product used in late spring and early summer. Leaves with heavy pear psylla nymph infestations were gathered from potted plants in the greenhouse at WSU-TFREC, and sprayed in the lab with the products listed in Table 1. There were 5 replicated of each treatment. Percent mortality of 4th and 5th instars, combined, was analyzed. Bexar was the most toxic product to pear psylla nymphs. 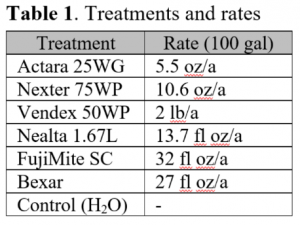 Of the registered products, Actara 25 WG and Nexter 75 WP were the most toxic (killing ca 60% of nymphs), while FujiMite SC and Vendex 50 WP were marginally toxic (killing 25 and 10% of nymphs, respectively), and Nealta showed no toxicity (killed 0 nymphs). No phytotoxicity by any treatment was observed. Fig 2. 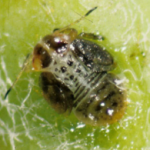 Pear psylla 4th and 5th instars nymph % mortality from various insecticides. 24 and 48 hr mortality were analyzed separately. Bars not sharing a common letter are statistically different. These bioassays were conducted to test various products against pear psylla nymphs. They are part of a series of experiments evaluating product efficacies against each life stage of pear psylla. 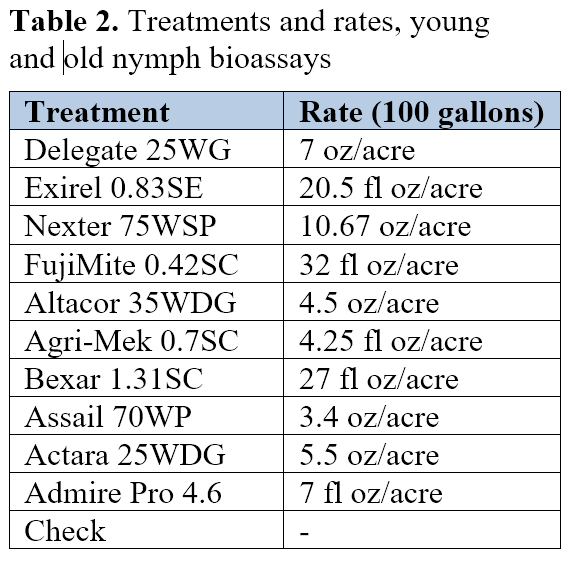 These two bioassays used the same products and similar methods; the first tested products against young nymphs (1st-3rd instars) 24 h after treatment and the second tested products against old nymphs (4th-5th instars) 48 h after treatment. Materials were chosen with input from local fieldmen. Leaves with heavy pear psylla nymph infestations were gathered from potted plants in the greenhouse at WSU-TFREC, and sprayed in the lab with the products listed in Table 2. There were 4 replicates of each treatment. For young nymphs (1st – 3rd instars combined), mortality was evaluated after 24 hrs and for old nymphs (4th and 5th instars combined), mortality was evaluated after 48 hrs. All treatments except Altacor resulted in significantly higher levels of mortality than the check. Delegate, Assail and Admire Pro resulted in 100% mortality, and significantly higher levels of mortality than Agri-Mek and Altacor. All other treatments resulted in intermediate levels of mortality (Figure 3). Fig. 3. Young nymphs – percentage mortality of pear psylla young nymphs (1st-3rd instar) 24 hrs following treatment. Bars not sharing a common letter are statistically different. All treatments except Admire Pro, Altacor, and FujiMite resulted in significantly higher levels of mortality than the check. 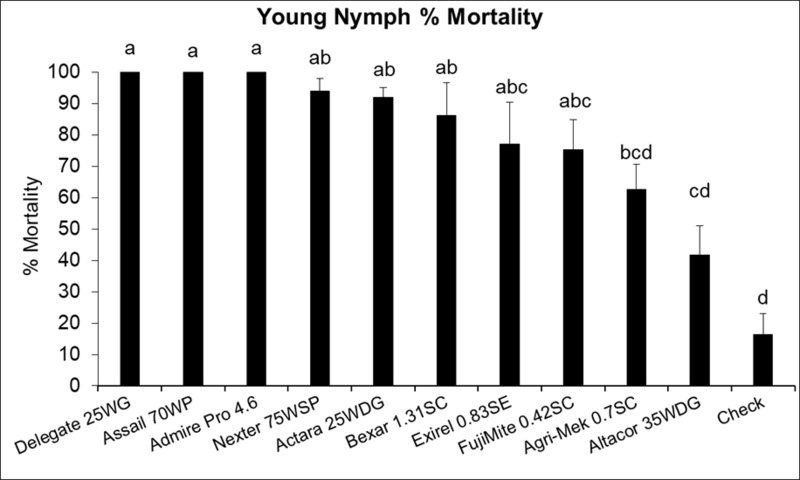 Bexar, Assail Agri-Mek, Delegate, and Actara resulted in the highest mortality levels (85-93%), and significantly higher levels of mortality than Altacor and FujiMite. All other treatments resulted in intermediate levels of mortality, except FujiMite, which had a slightly lower level of mortality than the check (Figure 4). Fig. 4. 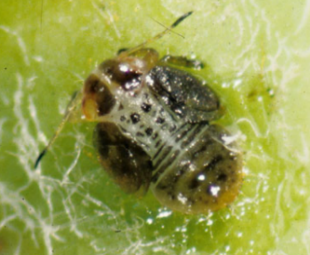 Old nymphs – percentage mortality of pear psylla young nymphs (4th and 5th instar) 48 hrs following treatment. Bars not sharing a common letter are statistically different. 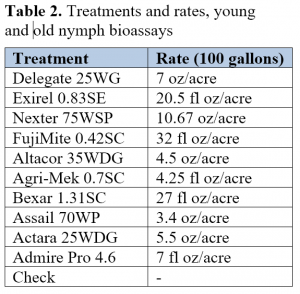 Assail and Delegate were the most effective products for nymphs, having the the highest levels of mortality for both bioassays (90-100%). Actara and Bexar also produced consistently high mortality levels (85-93%). Altacor had low mortality outcomes in both bioassays (17-42%). 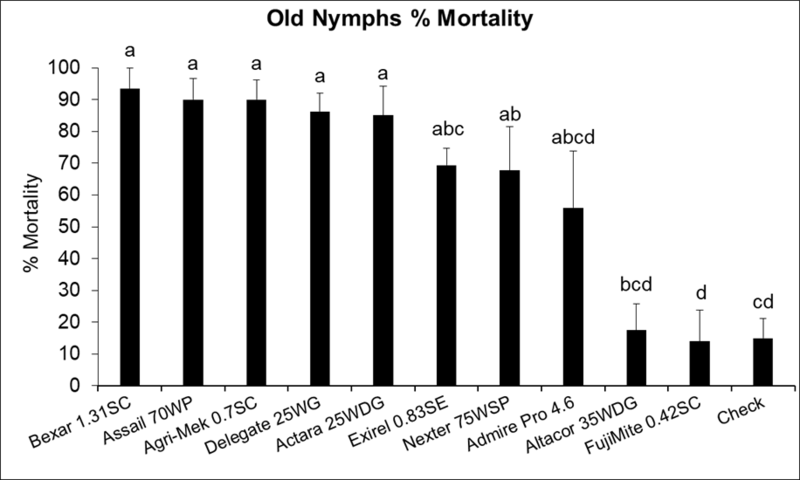 Most products performed better against young nymphs than old nymphs, except Agri-Mek, which performed very well against old nymphs (90% mortality), and poorly against young nymphs (62% mortality). It is possible that Agri-Mek may need more than 24 hrs to kill nymphs, or that it is more effective on old nymphs for an unknown reason. 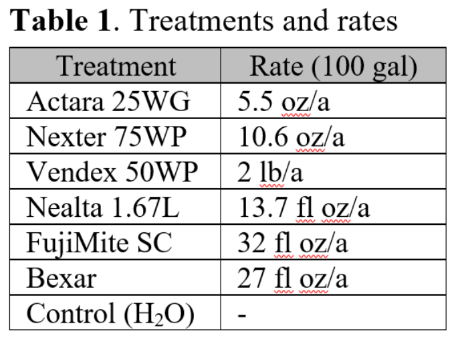 In future experiments, it may be necessary to test concentrations set to 200 gpa, as this spray volume is becoming more common for summer sprays by growers.